Mobile has joined cities and counties around the country in filing federal lawsuits against the manufacturers and distributors of several prevalent opioid painkillers — claiming the companies “intentionally and unlawfully” created a deadly and ongoing nuisance for communities. While local governments have sued national drugmakers before, the growing opioid “crisis” added significant momentum to the trend in 2017. Today, more than 200 such federal lawsuits have been filed, which doesn’t include multiple other lawsuits brought in various state courts. 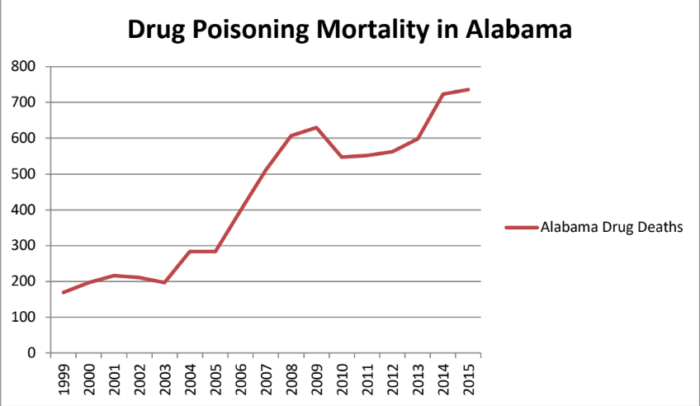 (Photo | U.S. District Court) Exhibits included in the city of Mobile’s lawsuit include this graph showing drug-related deaths in Alabama have soared since 2003. Alabama has disproportionately suffered from prescription painkiller abuse, at an estimated rate of 142.9 prescriptions per 100 persons, and Mobile has not avoided the effects. 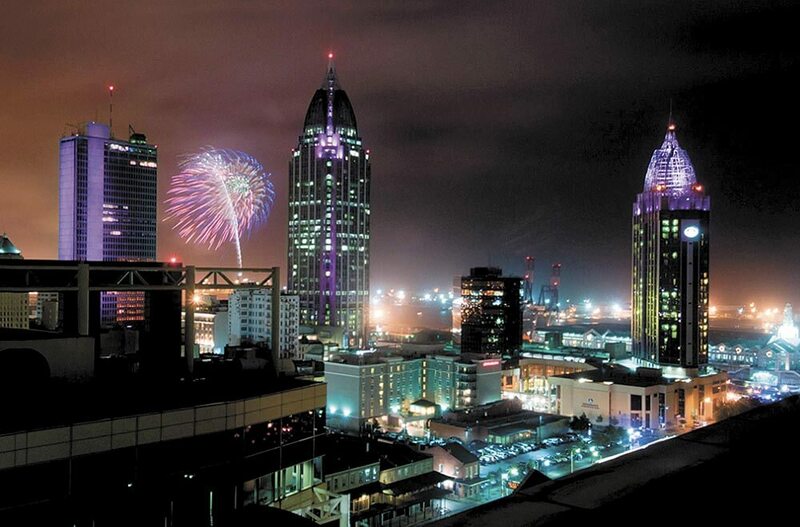 According to the city, drug poisoning deaths have increased significantly in recent years in Mobile County, which is expected to file a similar lawsuit in the coming weeks. 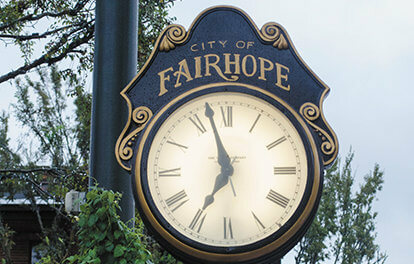 In their complaint, the city paints a picture of an opioid problem that’s a “public nuisance” — one Mayor Sandy Stimpson said Mobile has continued to bear the the brunt of because of the expense of treatment, education, law enforcement and services for children of drug abusers. As Lagniappe has previously reported, Mobile Infirmary and two hospitals in Mississippi filed a similar lawsuit against some of the same companies last month including manufacturers Purdue Pharma and Endo Pharmaceuticals and distributors such as the McKesson Corp.
That lawsuit was swept into pretrial proceedings before U.S. District Judge Dan Polster in Cleveland, Ohio, last month. The multidistrict litigation consolidated roughly 189 cases from Alabama, California, Illinois, Kentucky, Ohio, Washington and West Virginia — all areas disproportionately impacted by the diversion and abuse of prescription opioids. Multidistrict litigation (MDL) allows federal courts with similar cases to combine them under a single umbrella, which can accelerate the early stages of lawsuits, like discovery and pretrial rulings. Cases can be settled through MDL, but are sent back to their original courts if they move to trial. Some lawsuits filed after the 2010 BP oil spill were handled in a similar manner. Currently, it’s unclear whether the city of Mobile’s lawsuit would be lumped in with other cases like one involving Mobile Infirmary, though it raises similar accusations that opioid manufacturers and distributors used “false, deceptive and unfair marketing practices” to push their products. 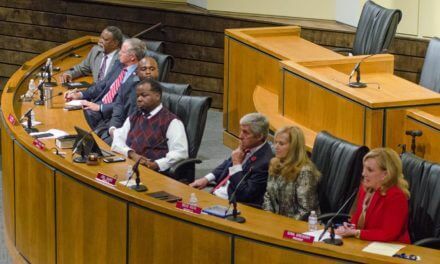 Like Mobile, several cities and counties have taken their attempts to stem the use of opioids to court, but unlike a handful of other states, Alabama has not fielded a similar legal challenge against those manufacturers directly. That could be partially due to government philosophy. While Marshall hasn’t pushed for a lawsuit on Alabama’s behalf, he is part of a bipartisan coalition of attorneys general participating in an ongoing investigation into whether drug manufacturers have engaged in unlawful practices. That group of 41 attorneys general has issued subpoenas for documents and testimony to determine the appropriate course of action in addressing opioid abuse. The group hasn’t officially identified any targets of its investigation, but it’s been reported the inquiry focuses on many of the same companies named in the flurry of recent civil lawsuits. Marshall also oversees the newly created Alabama Opioid Overdose and Addiction Council, which was established by Gov. Kay Ivey in August. In response to the recent flurry of lawsuits, many of the companies named as defendants have denied all allegations of improper or fraudulent business practices and many have touted their efforts to make opioids that are hard to abuse or divert. Last week, the Healthcare Distribution Alliance, a national trade association representing drugs distributors like AmerisourceBergen, Cardinal Health, and McKesson, released the following statement to Lagniappe from Senior Vice President John Parker. “As distributors, we understand the tragic impact the opioid epidemic has on communities across the country. We are deeply engaged in the issue and are taking our own steps to be part of the solution – but we aren’t willing to be scapegoats. “Distributors are logistics companies that arrange for the safe and secure storage, transport, and delivery of medicines from manufacturers to pharmacies, hospitals, long-term care facilities, and others based on prescriptions from licensed physicians. We don’t make medicines, market medicines, prescribe medicines, or dispense them to consumers. “Given our role, the idea that distributors are solely responsible for the number of opioid prescriptions written defies common sense and lacks understanding of how the pharmaceutical supply chain actually works and how it is regulated. Updated at 12:15 p.m., Jan. 4, to include a statement from the Healthcare Distribution Alliance.